The Ecuadorian Tourism Ministry has organised a guiding course for Huaoranis interested in becoming local tourism guides. The two dozen Huaoranis participating in the course, including both men and women, is a great opportunity to formalise and expand the guiding opportunities for the Huaorani. Darwin Javier Licuy, the Director of Tourism for the province of Orellana, stated that the training is part of a drive by the Ministry of Tourism to improve the opportunities open to indigenous communities living in these immensely rich areas both in terms of the biodiversity and diverse cultures. The initial phase of the course ran in November and December last year. The current phase will conclude on the 5th February. The training event is supported by the Ministries of Environment and Tourism and the Tourism Directive of the Municipal Government of Francisco de Orellana. 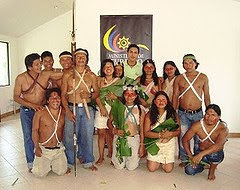 A number of Huaorani who live in one of the five communities making up the Association of Quehueri'ono, where the Huaorani Ecolodge is located, are attending the event. Those attending the initial phase told me that the course has so far proved to be a very useful revision for those already guiding at the lodge and a great introduction for those interested in guiding in the future. The final night of the course last year where typical Huaorani dances were performed was a particular hit with all those involved!